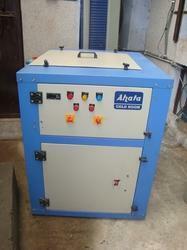 Manufacturer of a wide range of products which include brine chiller and process chillers. We are offering Brine Chillerto our clients. Ahata industries is renowned manufactures and service provider of water cooled water chillers,Our designed water cooled chillers are made up premium material that make them highly durable and earn higher demand in refrigeration industries.we also provide customized designs for these units in accordance with specific requirements of clients.These chillers are easier to operate and require minimum maintenance that makes them widely preferred among customers. we design and stringently check Industrial Process Chillers before the final dispatch so that bring our customer right product,they expect for. We cater our customers varied requirements and stand up to their expectation in items of quality in a standard level throughtout the country.Also,we offer the customized industrial process chillers in accordance with client;s requirements . Our team of qualified and experienced professionals is declared to manufacture and supply genuine material made air cooled water chillers systems. Being a professionally managed and reliable water chilling units manufacturer and service provider,we provide a high performance water chilling plants used in various industries. These advanced international chilling plants are used for water up to -40 deg c . Chilled water is used in various industrial processes such as chemical industry,mould cooling,milk plants,food industry and many others. Chilled water is a source of indirect cooling energy,centralized at one place and circulated to entire plant at various used. We also customize designs as per the requirements of the clients.We have a free sampling policy and pack our consignments as the client specify. These units save higher cost of maintenance and problem of installing refrigeration system individually for each machine at plant.Advance International Chilling plants are fabricated by using best quality material as per various Indian and International standards.The imported instrumentation is used for reliable operation and system protection.Our heat exchanger for Freon to water chilling is designed in combination with Freon circuit,blower fan and condenser.Condenser sizing is designed to have better efficiency and saving energy,which is an important factor in any industry for any equipment. compact size due to better designed heat exchanger,condenser with optimum air flow with high speed blower fan. Imported expansion value used instead of capillary tubes in Freon for better cooling. Less power consumption of equipment due to high efficiency micriprocessor control system. Easy operation and less maintenance. We are offering Process Chillers to our clients. Ahata industries is renowned manufactures and service provider of water cooled water chillers,Our designed water cooled chillers are made up premium material that make them highly durable and earn higher demand in refrigeration industries.we also provide customized designs for these units in accordance with specific requirements of clients.These chillers are easier to operate and require minimum maintenance that makes them widely preferred among customers. we design and sstringently check Industrial Process Chillers before the final dispatch so that bring ourcustomer right product,they expect for. We cater our customers varied requirements and stand up to their expectation in items of quality in a standard level throughtout the country.Also,we offer the customized industrial process chillers in accordance with client;s requirements . Our team of qualified and experienced professionals is declared to manufacture and supply genuine material made air cooled water chillers systems. Being a professionally managed and reliable water chilling units manufacturer and service provider,we provide a high performance water chilling plants used in various industries. These advanced international chilling plants are used for water up to -40 deg c . Chilled water is used in various industrial processes such as chemical industry,mould cooling,milk plants,food industry and many others. Chilled water is a source of indirect cooling energy,centralized at one place and circulated to entire plant at various used. We also customize designs as per the requirments of the clients.We have a free sampling policy and pack our consignments as the client specify. These units save higher cost of maintenance and problem of installing refrigeration system individually for each machine at plant.Advance International Chilling plants are fabricated by using best quality material as per various Indian and International standards.The imported instrumentation is used for reliable operation and system protection.Our heat exchanger for Freon to water chilling is designed in combination with Freon circuit,blower fan and condenser.Condenser sizing is designed to have better effeciency and saving energy,which is an important factor in any industry for any equipment. Looking for Water And Milk Chillers ?